A year or two back, the husband and I decided that what we REALLY wanted for Christmas, was nice robes. The kind that we could wear around the house INSTEAD of pjamas or sweats. The kind that if others stayed over, we wouldn't be EMBARRASSED to be seen in. The kind that just wrapped themselves around us in all sorts of SOFT and FUZZY goodness. We also decided all that ON THE SPOT, in about 30 seconds FLAT, in Restoration Hardware when we noticed, and then TOUCHED, their Luxury Plush Robe collection. Laid out of course in the most beautiful fashion, all "dressed up" for the "ideal Christmas gift", we were sucked in, drawn in, and immediately DRESSED in, these robes. And while yes, *I* am an impulse shopper at times, the husband isn't. So when he put this robe on over his sweater and jeans, and started... ummm... rubbing himself all over (to touch the robe!! ), I knew, right then and there, that for ONCE in our marriage, I was going to get the instant gratification I so desperately enjoy. And at $79, these robes were WORTH every penny - they still ARE worth every penny. Our choice? While my preference is almost ALWAYS white for a robe, that year, we chose chocolate brown instead. We got all "grown up" about it, and thought that the chocolate brown would more slyly HIDE the greasy neck stains that show up on white robes, it would hide the breakfast-food-spillage stains that show up on white robes, and well, it'd just hide the fact that sometimes we are pigs. Of special note with these robes? With a TON of washes under their belts, they STILL feel velvety soft, and we STILL put them on sometimes, just to sit in front of the fireplace and eat our dinner. Cuz these robes? They're THAT good. And right now, on the Restoration Hardware website, they're ON SALE for $59! Go, quick! I love a good robe, too! How I would love to have coffee with you and our misters in a set of chocolate robes. 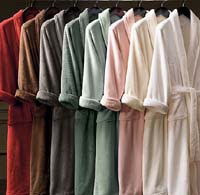 I'm bookmarking this post because I think I'll be in the market for bathrobes soon. who would have thunk it? restoration hardware sells robes?